Hey! What's a leprechaun doing here in our Halloween post? It must be a trick instead of a treat. 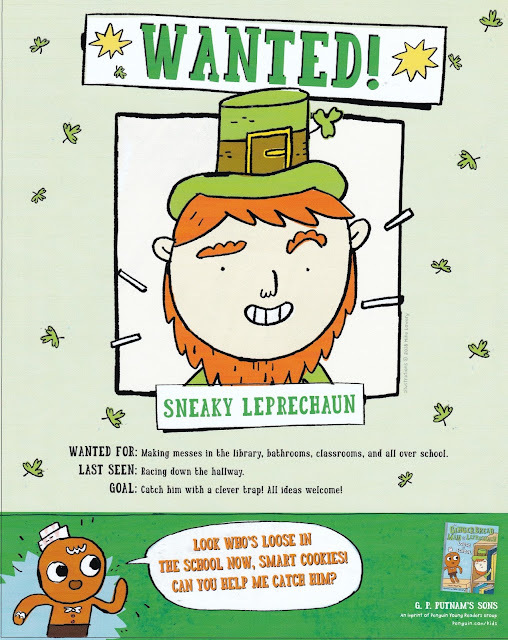 I heard that this sneaky Leprechaun is planning to crash Gingerbread Man's tale in January, but I did not expect him to crash the ReFoReMo blog. Will somebody catch him, please? Wait a minute... he left us a treat, too! 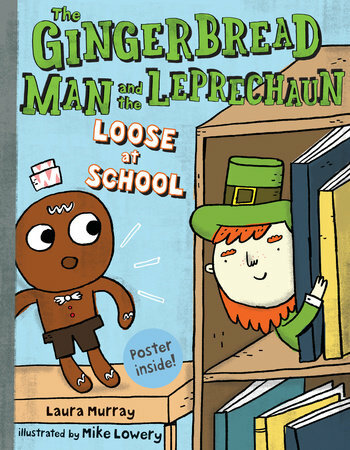 It's a chance to win a folded and gathered (F&G) review copy of The Gingerbread Man and the Leprechaun Loose at School! Trick or treat, indeed! Curious about the mischief he will cause in this tale? U.S. residents may enter the drawing by sharing your mischief predictions. See the Rafflecopter below to enter by November 6. May the luck of the Irish be with you this Halloween! Hi Sean! 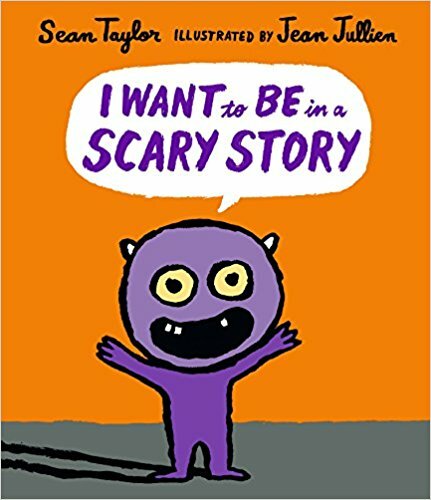 I love how your book, I Want to Be in Scary Story, addresses Little Monster's very real fears in a hilarious way! Thanks for visiting ReFoReMo! Good for stories or good for walks? Love them or leave them? I’d be delighted to have either as a friend. Hide and seek or Duck duck goose? Run away or face them? You have to face your fears. Until you do, they’ll run after you. It takes one and a half hours to hard-boil an ostrich egg. I WANT TO BE IN A SCARY STORY or I WANT TO BE IN A SCARY STORY? Impossible to choose between these two. This story is such a fun new Halloween story for those who don't want to be TOO scared, just like Little Monster! 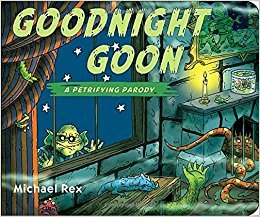 The dialogue between little monster and the narrator is hilarious and sure to make you and your child laugh. 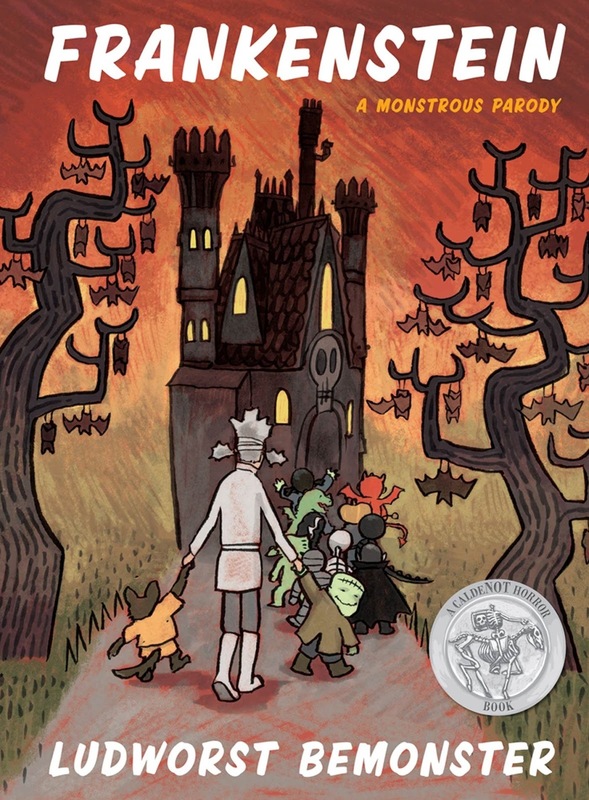 I can't wait to read this to a classroom full of kids on Halloween! 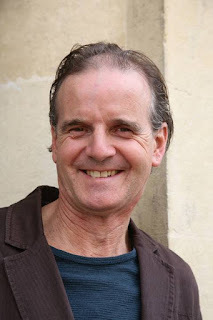 Sean Taylor is an award-winning author of 50 books for young readers of many different ages. 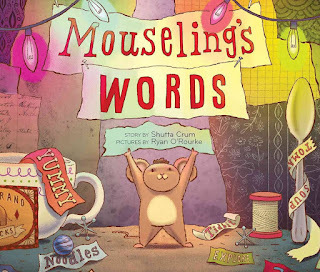 His picture books include Hoot Owl Master of Disguise, It’s A Groovy World, Alfredo!, Robot Rumpus, When a Monster is Born and Crocodiles are the Best Animals of All! He has also written the Purple Class series of comic adventures set in an urban primary school, a collection of folktales from the Amazon called The Great Snake, and the novel for teenagers A Waste of Good Paper. Over the years he and his family have spent spells living in England (where he was born) and Brazil (where his wife is from). www.seantaylorstories.com. 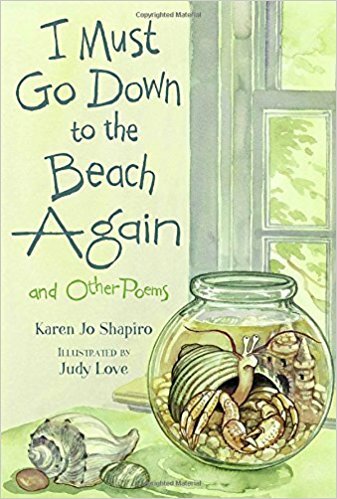 Karen Jo Shapiro rewrites John Masefield's poem Sea-Fever. And all I ask is my red toy boat with a string to pull it by…,"
And all I ask is a tall ship and a star to steer her by;"
"If you run away," said his mother, "I will run after you. For you are my little bunny." 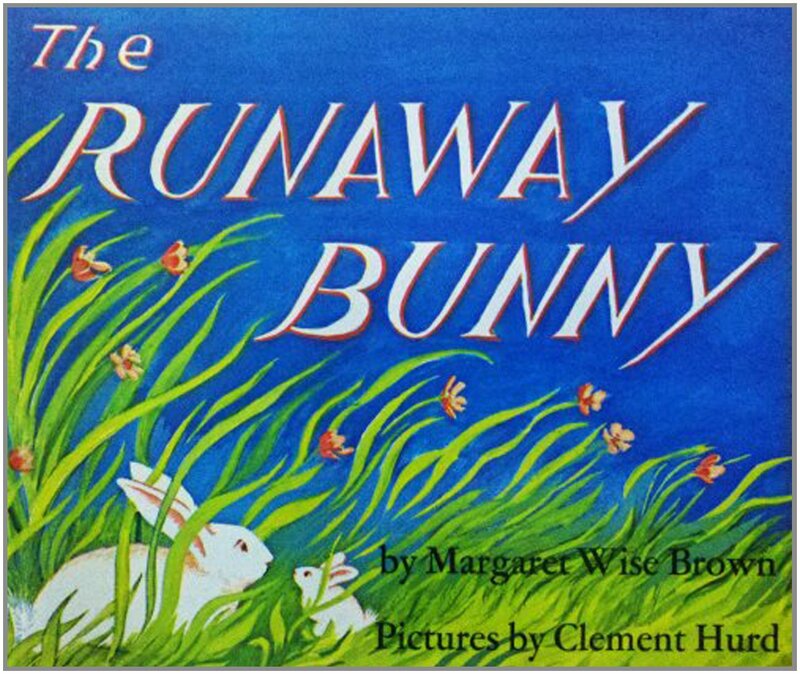 "If you run after me," said the little bunny, "I will become a fish in a trout stream and I will swim away from you." "If you become a fish in a trout stream," said his mother, "I will become a fisherman and I will fish for you." Change one word in the title and run with it. Change the first line just enough to make it recognizable. Check out this petrifying parody. 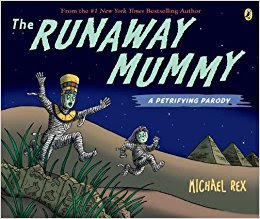 "If you run away," said Mother Mummy, "I will get you! For you are my rotten little mummy." "If you try to get me," said the little mummy, "I will turn into a serpent that lurks at the bottom of the sea." "If you turn into a serpent," said Mother Mummy, "I will become a sea monster that will wrap around you and never let go." Ready for another spooky take on a famous story. Keep the same rhyme and rhythm as the original. And there were three little bears sitting on chairs"
There's that one word title change again. And there were three little mummies rubbing their tummies"
This time also look at the pen name of this monstrous parody. Here is your challenge. Write a parody. Share your parodies with us in the comments. 1. Select a song, poem, or story. 2. Change the first line just enough to make it recognizable. 3. Keep the same rhyme and rhythm as the original. 4. Have fun playing with words. I love picture books that feature unlikely friends. 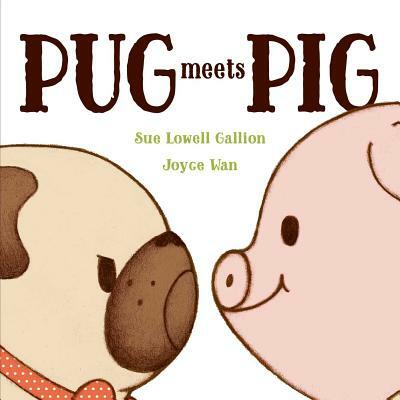 Author Sue Lowell Gallion introduced Pug and Pig in September 2016 and they earned a starred review from Kirkus. 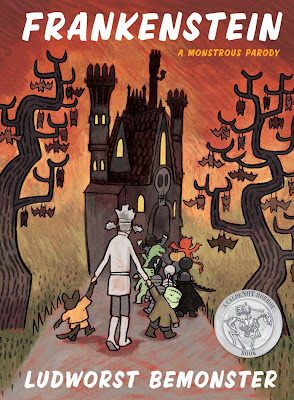 Now they are back just in time for Halloween and they've earned starred reviews from BOTH Kirkus and Publisher's Weekly. 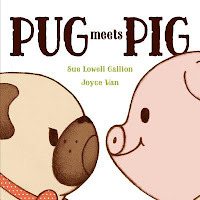 Hooray Pug and Pig! Welcome, Sue! Do you utilize picture books as mentor texts? 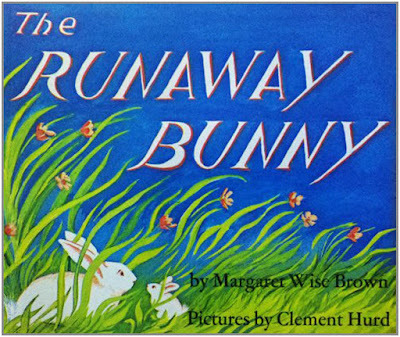 I request a ton of picture books from the library. My local branch, bless them, stacks them all on one bottom shelf. I read a picture book both aloud and silently. If a book’s pacing particularly intrigues me, I handwrite the text with the page breaks in a notebook or type it out. I look for the heart of the book and try to evaluate what made that manuscript stand out. When I’m wrestling with a certain element in a manuscript—such as a character searching for a meaningful plot—I study books for that specific element. I also have a healthy fear of rhyme and a great deal of respect for writers who do it well. 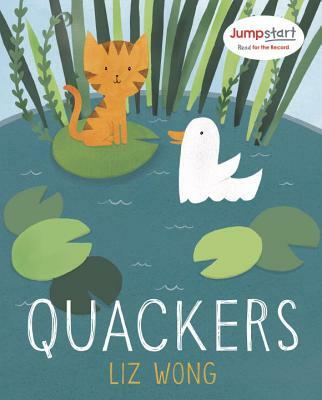 I’m working on some rhyming manuscripts, so I study a lot of rhyming books. 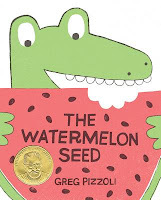 Mentor texts are helpful in terms of positioning a manuscript as well. For example, if I’m working on a text with a hippo as a main character, it’s useful to search out and study other recent hippo picture books to be aware of the market. Perhaps most importantly, when I get together with critique partners, we always bring books to share or trade. 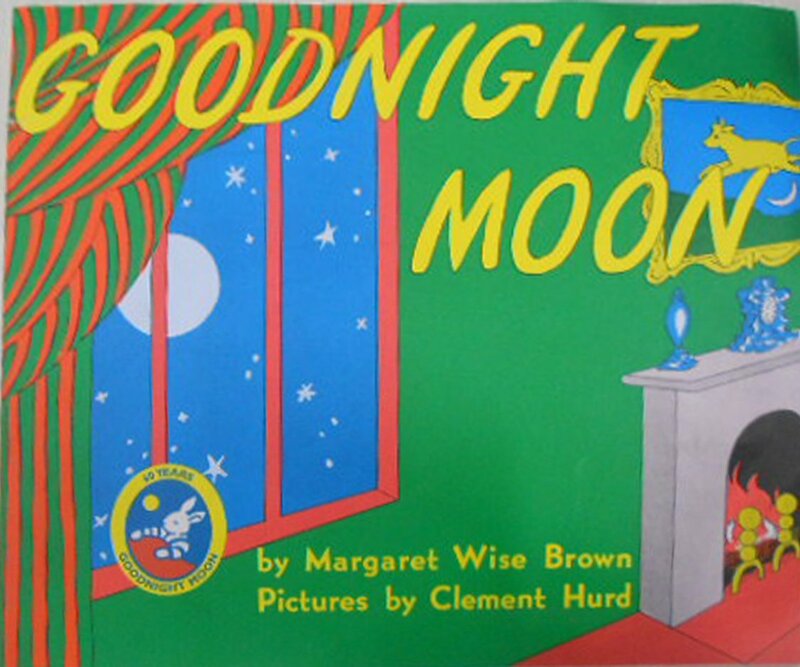 Some we simply read aloud together, admire, and enjoy. Others we discuss in depth. 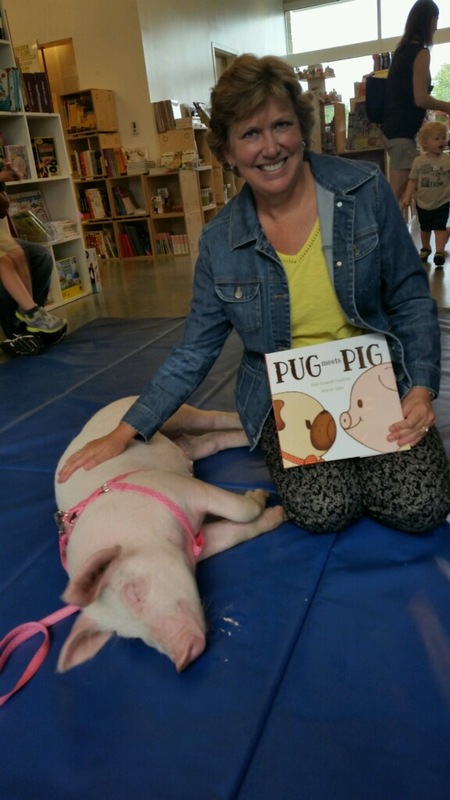 And from the looks of the picture, you studied the character of pig with hands-on research! 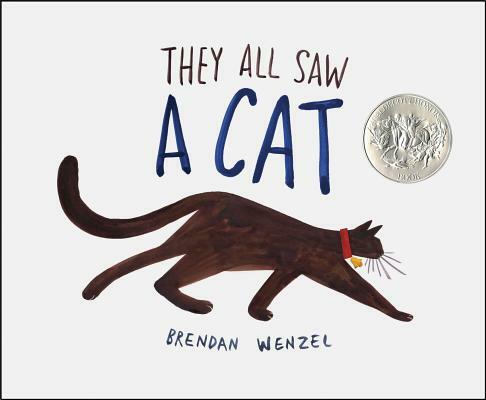 How has reading picture books helped you discover who you are as a writer? I’ve been a volunteer reader with first and second-graders through a local literacy program, Lead to Read, for a number of years now. We’re paired one-on-one for the school year and are together with our student (and sometimes extras) for 30 minutes each week. A lot of these kids are struggling readers and so frustrated. 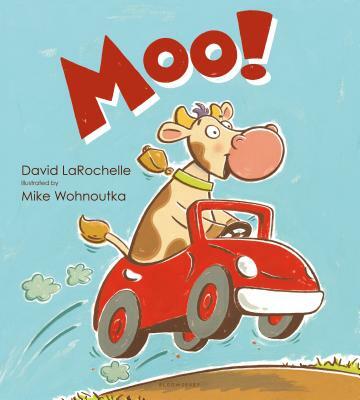 A humorous picture book like MOO! by David LaRochelle, ill. by Mike Wohnoutka – which only uses five words—can get them reading and laughing and give them confidence. 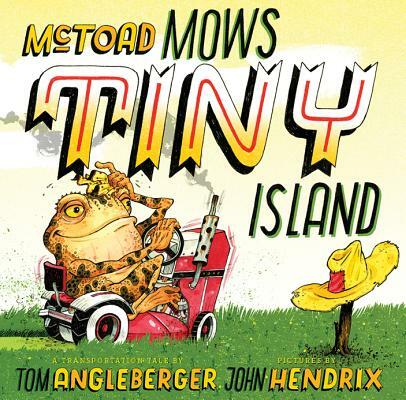 So I’m always on the lookout for picture books that work as early readers but offer more, whether it’s intriguing illustrations (Brendan Wenzel’s THEY ALL SAW A CAT), an unusual perspective (ABC: THE ALPHABET FROM THE SKY by Benedikt Grob and Joey Lee) or humor (McTOAD MOWS TINY ISLAND by Tom Angleberger and John Hendrix, THE WATERMELON SEED by Greg Pizzoli, or QUACKERS by Liz Wong are some of my favorites.) I hope some of my work will meet this need, too. 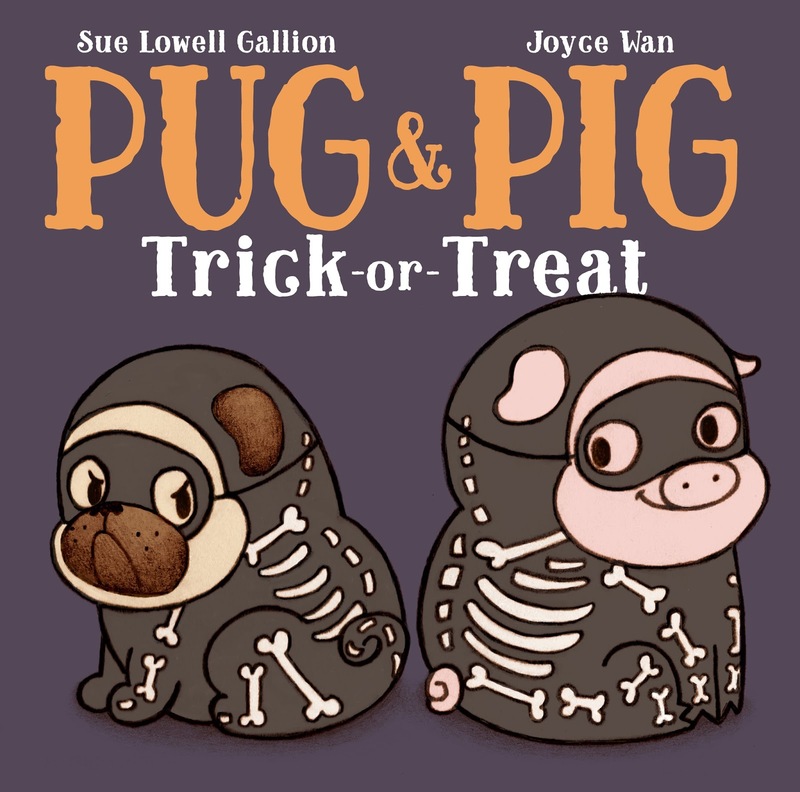 Were there any particular mentor texts that inspired you in the creation of PUG & PIG TRICK-OR-TREAT? 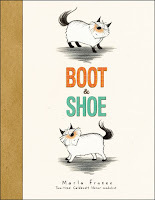 A mentor text that I used for PUG MEETS PIG, which came first, was Marla Frazee’s BOOT & SHOE. Both books have two main characters, no dialogue, and a straightforward voice. 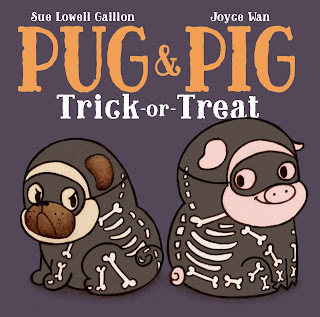 I hadn’t planned to write a second Pug and Pig book, but a Halloween encounter with my dog and the dog next door inspired me to write PUG & PIG TRICK-OR-TREAT. As a companion book, the structure of the narrative was already established as well as the voice. 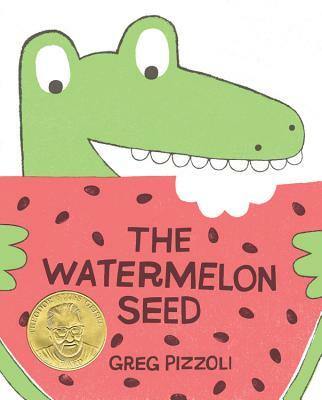 I looked for mentor texts to study how others further developed characters. 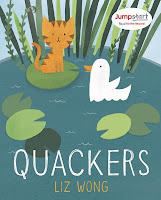 The CLICK, CLACK series by Doreen Cronin, illustrated by Betsy Lewin, are great examples. Each book successfully stands alone, too. Thanks for talking mentor texts with us, Sue! Born in the mountains of Kentucky, Shutta Crum grew up listening to stories. Spinning tales is a big part of her Appalachian heritage and she carries on that tradition today. Her award winning books earn starred reviews and appear in the New York Times. She is a retired librarian, publishes about writing in professional journals and is a public speaker. 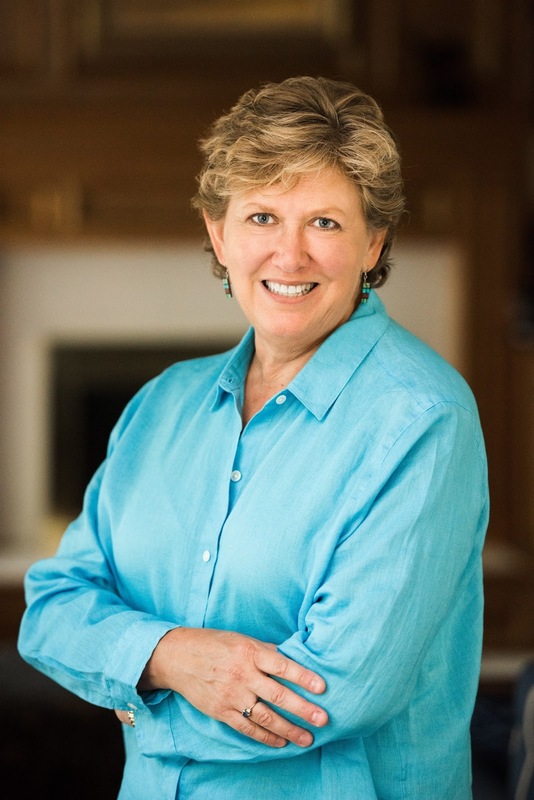 Below are a few of many things a writer learns studying stories by Shutta Crum. Shutta’s voice is heard through dialogue, lyrical language, word choice, the way her character’s interact with each other, point of view and subject matter. In her books written in first person, a reader feels like they are in the mountains or in the middle of a storm listening to the protagonists tell their tales. Writers will find excellent examples of how to keep voice authentic and immediate in Shutta’s stories. “In the mountains down south, morning is musical. Dad plows, his tractor glinting in the sun. Tom slaps his feet against the surface of the pond. I sprawl in the shade of the chestnut tree. Folklore has its roots in the oral storytelling tradition dating back centuries. 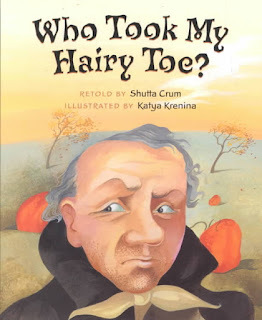 In Who Took My Hairy Toe?, Shutta used the structure of an old tale and made it her own. 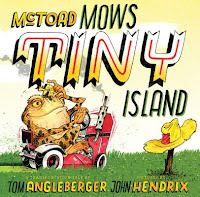 This retelling is about a grumpy old man who finds a toe when stealing from his neighbor’s garden. It uses a classic structure, i.e., exposition, rising action, climax, falling action, denouement. Tension builds in in every spread with the repetition of “Who took my hairy toe?” It is as scary as any of the original tales from the Brothers Grimm and a great one to read aloud for Halloween! Shutta used a parallel story structure in Click! to illustrate the similarities between a polar bear cub and his mother and a boy and his mother on an adventurous day. The bear went out to learn how to hunt, and the boy went out to learn how to use a camera. In A Family for Old Mill Farm, human and animal realtors take families to look for a new place to live. 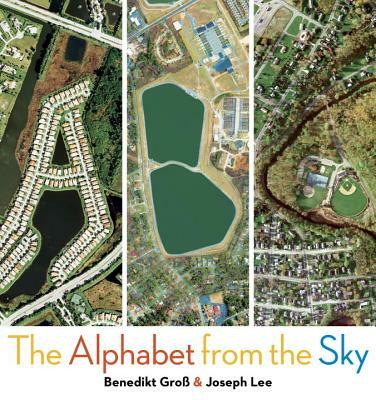 Readers learn about different habitats in this lyrical text that lead to all of the families living in Old Mill Farm. The Bravest of the Brave is a counting book with a narrative arc. 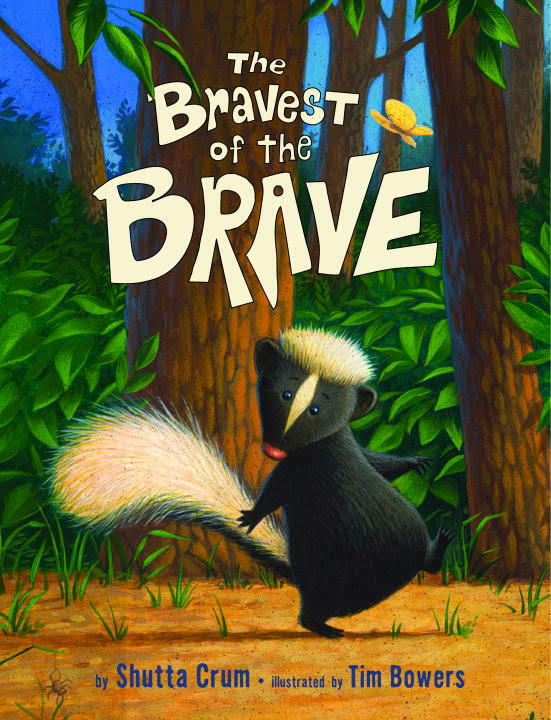 It tells the story of a skunk who must go through the woods alone to get home. But is he? 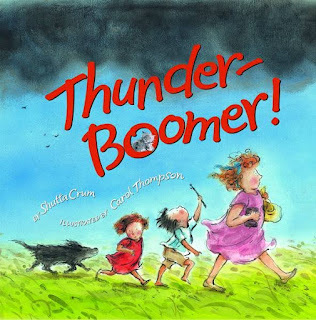 Shutta uses classic plot structure and storytelling techniques (conflict, rising tension in each page turn, a memorable character) to tell this charming story of what it means to be brave. When an author submits a book with 9 ½ repetitions of the same word (mine) and one other (woof), without a dummy, there will be art notes! Shutta described how she wrote the manuscript, MINE!. In this almost wordless picture book, she wrote in detail the physical action and emotional reactions in "beats" used in script writing. She showed how the story would unfold in the illustrations. 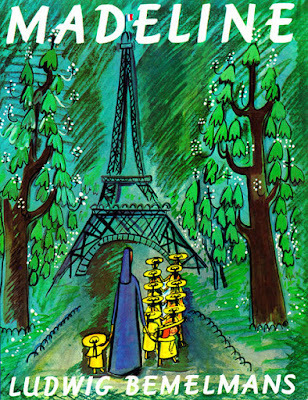 She didn’t dictate what the illustrations should look like, just the sequence of what was happening from scene to scene. That adorable duo, Shutta and illustrator Patrice Barton, teamed up again to create another nearly wordless book, Uh-Oh! Both are fun books about toddlers, Mine! is about sharing, and Uh-Oh! is about mishaps at the beach. 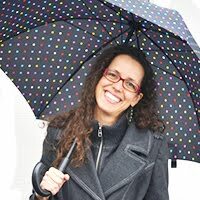 Go to Shutta’s website to find articles she’s written, handouts from her workshop presentations and other resources for teachers and writers. 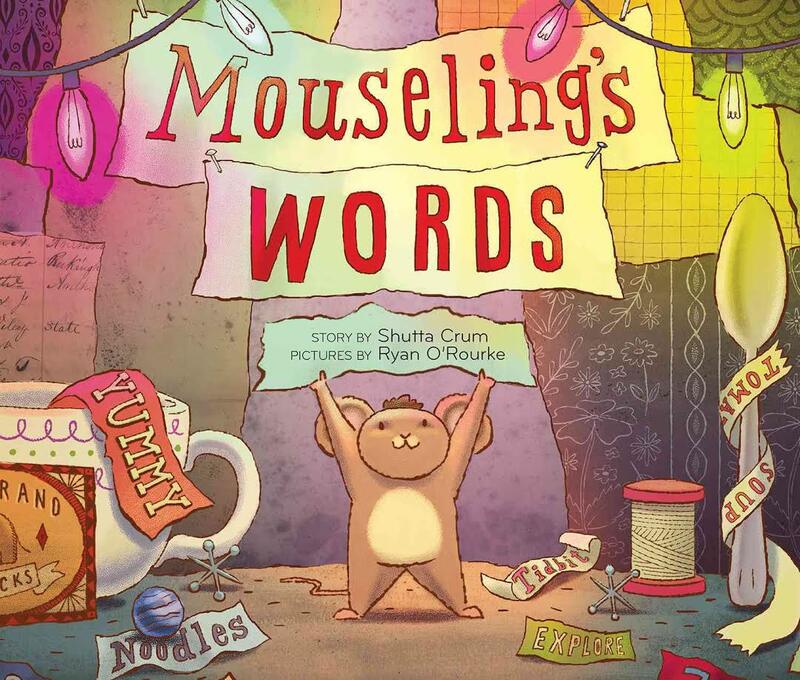 Look for her new book, Mouseling’s Words, in December 2017 about how a mouse and a cat appreciate the power of words. 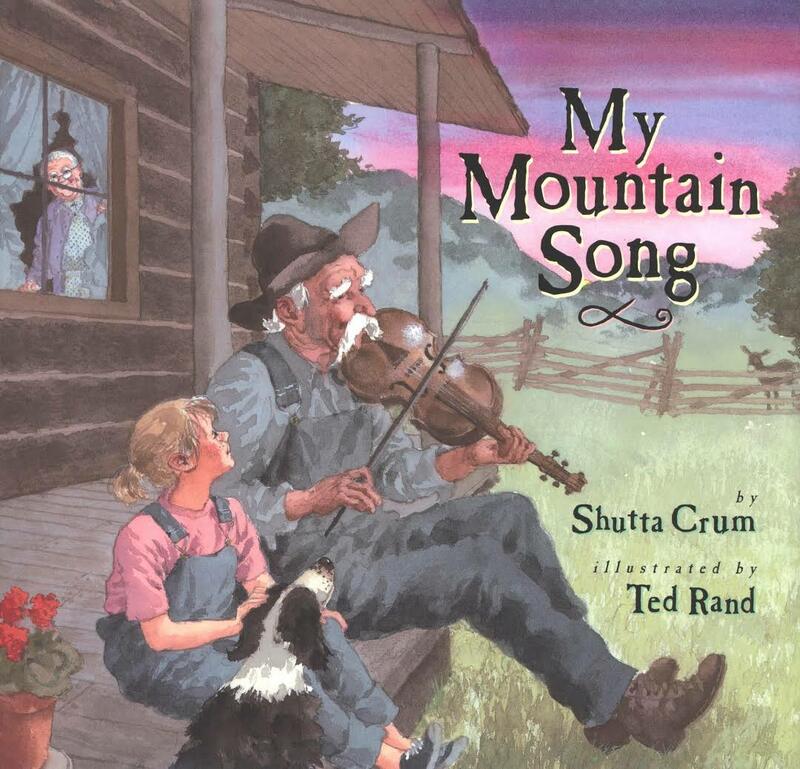 From her distinguished work writing picture books and novels, that's something Shutta Crum knows a lot about.